I am always on the lookout for more kitten tees, and the other day when I took a sick day, I decided I needed to draw some kittens while I was watching TV. So I did. And then I was like...I should make these into another kitten tee. So, I scanned it in, and I took to Zazzle. In case I haven't said this enough times, I really love Zazzle. It's an online printing site where you can order all kinds of custom printed items from greeting cards to plates to totes to tees, and the interface is really easy. All you have to do is upload your image, and they show it to you on the blank item you've chosen. Once you've created your custom item, if you want, you can post it for sale - for free! Zazzle has their very own marketplace, and you can post anything you make there with tags, a name, and a description. They also have this cool feature where you can choose the amount of profit you make on your items. Zazzle, of course, has to take a certain amount of money to cover costs and production, but you can manage how much money you'd like to make. Since I am making mine for my own enjoyment, I have it set to, like, 10% of total price, which ends up being somewhere around a dollar, but still. It's super cool. 1. 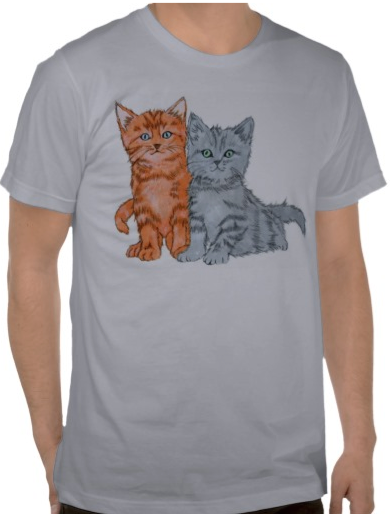 I made a new kitten tee, and you can check it out at http://zazzle.com/spinsterstore.